The habit of smoking is an acquired pattern of action that is automatic an thus, difficult to break. There must be a conscious desire to achieve anything before the subconscious mind will apply the information required for you to change or break a habit. 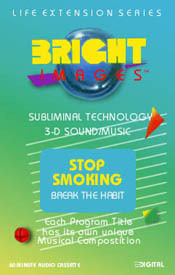 In combining your desire to change with subconscious programming, the desire to smoke is eliminated and quitting is entirely achievable. This revolutionary technique eliminates torturous withdrawals and you can quit smoking for good and be healthy. This program deals with concepts about health, appearance, confidence thinking energy, oxygen, blood, self-image, achievement and success. It deals with all of the elements involving behavioral transition to make it as easy as possible. Because it does create a conscious/subconscious conflict, headaches or nausea may develop, but they tend to subside in a short time.